Starters is about a time in the future where senior citizens can "rent" bodies of younger people so they can experience what it's like to be young again. While our young protagonist, Callie, has doubts about renting her body out, she knows how much the money will help her and her brother make a better life for themselves. Callie soon finds out, however, that her renter has something much more nefarious planned than just the typical banal partying and playing sports, and if she doesn't do something soon, she might find herself accused of murder. But in her attempts to stop her renter from killing someone, she unravels a much more macabre plot afoot from the very place that is renting out her body. 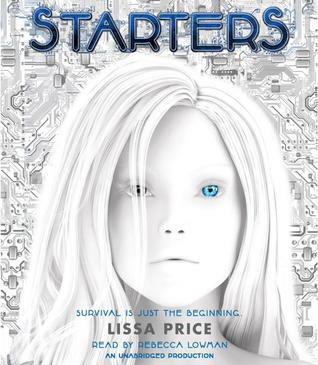 This book was never on my radar so I'm happy Lissa offered me a review copy of both Starters and Enders. I thoroughly enjoyed the audiobook much more than I expected to and I am looking forward to reading the sequel. If you're someone like me who isn't a huge fan of science fiction, this is a good book to get your feet wet so to speak. It's not overly science-y, and the plot has a few twists and turns along that way that keep it interesting and page-turning. Rebecca Lowman is the narrator for the audiobook and is probably most well-known for narrating Eleanor and Park. Her voice is both soothing and provocative at the same time, as she hits just the right emotional highs and lows. I'm definitely going to be seeking out the audio of the sequel as well.